The elections held across the European Union (EU) from 22 to 25 May 2014 have delivered their verdict and returned a significantly different set of representatives to the European Parliament (EP). LNE Group’s EU Public Affairs Practice believes that these results are unlikely to significantly affect the development and implementation of the EU’s policies in support of Research and Innovation (R&I). The new political landscape will however impact the EU’s legislative work and the way decisions are made in key policy areas. Companies willing to leverage EU political and financial support for their innovation initiatives will need to adapt their engagement strategies accordingly. The centre right European People’s Party (EPP) and the centre left Progressive Alliance of Socialists and Democrats (S&D) remain the largest parties, with 213 and 191 Members of the European Parliament (MEPs), respectively. They are followed by the centrist Alliance of Liberals and Democrats for Europe (ALDE), the environmentalist Greens/European Free Alliance (G/EFA), and the socialist European United Left (GUE), each represented by 40 to 65 MEPs. The anti-federalist alliance of the European Conservatives and Reformists (ECR) obtains around 40 seats and may struggle to form a parliamentary group. Media coverage following the elections has focused on the rise of populist and Eurosceptic parties such as the UK Independence Party, France’s National Front or Denmark’s People’s Party. While those parties indeed increased their representation to a total of 108 MEPs, this still represents less than 1/7th of the total number of MEPs, very far from the absolute majority required to pass legislative acts (376 votes out of 751). In addition, significant differences exist between those parties, which may struggle to form a coherent bloc in the new EP, and whose members have traditionally had a track record of low attendance and participation in EP activities. The influence of Eurosceptic MEPs on the legislative process is thus likely to remain limited, even if they may have a slow-down effect on proceedings. The Eurosceptic vote nevertheless sent a strong political message to EU leaders, who decided to revisit the EU’s agenda and conduct consultations set to last at least until the end of June before appointing the President of the European Commission for the period 2014-2019. Changes in the EP’s political make-up are unlikely to significantly affect the EU’s R&I policies. The budgets for the EU’s R&I funding programmes (i.e. Horizon 2020) have been set till the year 2020, and the role of the EP is limited when it comes to drafting strategic research programmes, work programmes and funding calls. However, the EP will have to approve the future members of the European Commission proposed by EU Member States, including the candidate for Research and Innovation Commissioner. This will be done by a majority vote and is likely to result in political horse-trading between the main parliamentary groups. The approval process may be used by the EP to influence the EU’s future R&I policy agenda, which may to some extent have an impact on funding priorities over the coming years. The changes in the political make-up of the EP will impact the EU’s legislative work, as party majorities have shifted significantly. Neither the EPP nor the S&D have obtained an absolute majority, and the ALDE group cannot claim the role of kingmaker by partnering with either of them to create a majority. It is therefore likely that ad-hoc majorities will have to be formed, which may evolve overtime or according to policy areas or issues. 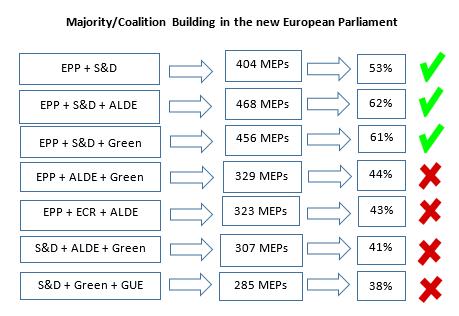 The following diagram provides an overview of possible majorities or coalitions in the new parliament. Together, the two main parties will thus hold only a slim majority in the new EP, meaning that they will have to get votes from some other groups – primarily ALDE – for adopting measures in areas where they may not fully agree. Where they openly disagree, forming a majority is likely to be very challenging. The new EP make-up is also expected to affect policy areas. The EU-US free trade negotiations could attract more criticism, as they will face opposition from the left but also from some on the far-right, calling for more protectionism. There could also be more division on whether to further liberalise the internal market in services, as well as less support for budget consolidation and stronger opposition to migration. The most pressing issue for the incoming EP, however, will be the adoption of climate and energy targets for 2030. These targets must be decided by October 2014 and will play a key role in determining future investment plans of the European industry. The outgoing parliament called for more ambitious targets for renewable energy usage and energy efficiency than those proposed by the European Commission. However, the alliances needed to form a majority in the new EP may make it more difficult for the institution to challenge the Commission and Member States. The new EP composition will affect the way stakeholders engage with the EU institutions to make their voices heard and to influence decision-making. Greater focus will have to be put on engaging with the two main parliamentary groups (EPP and S&D), as smaller groups will no longer have a king maker role. Stakeholders will also need to encourage the European Commission to develop draft laws that are politically acceptable to both the centre left and centre right, with a view to avoid legislative roadblocks. To this end, stakeholders will need to encourage MEPs to champion their cause at an early stage (e.g. when the European Commission prepares a legislative proposal), so as to lay the ground for building solid majorities. Companies willing to leverage EU political and financial support for their innovation roadmaps will need to adapt their engagement strategies accordingly. All political groups are to be formed by 24 June. The new parliament will hold its constitutive assembly in the first week of July. During this inaugural session, the newly elected MEPs will elect group heads and allocate rolls within the various Parliamentary committees. The larger groups will be able to claim more influential rolls within committees. In July also, EU Member States will confirm their choice for European Commission President, who may or may not be the candidate put forward by the Parliament. The EP will then have to formally ‘elect’ the nominee with an absolute majority. In September and October, MEPs will interview and approve the new European Commissioners, as selected by the Commission President, and will start their legislative work.